Medical Uncertainty: Is there a Doctor in the Clinic? This is a flyer included with Wednesday’s newspaper. 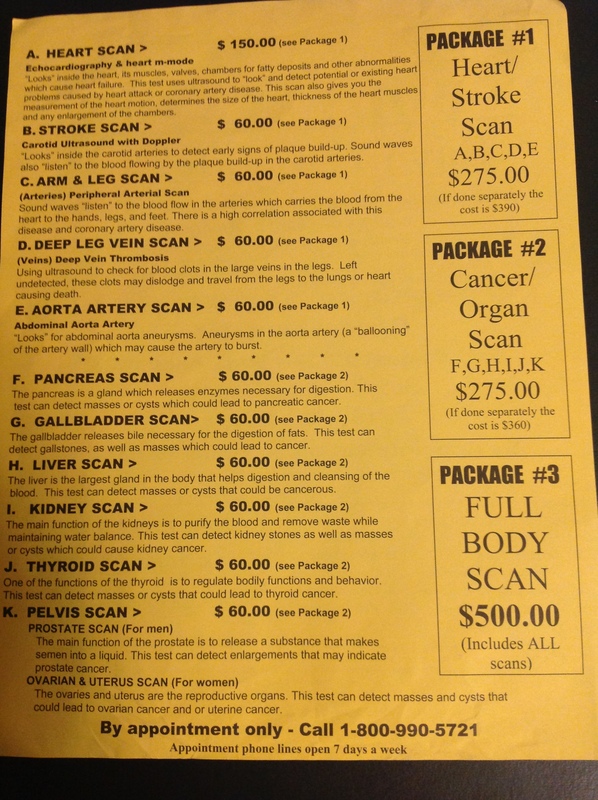 Bright yellow, black lettering – great visibility in the pile of flyers and junk – telling the reader, “A BODY SCAN Can Save Your Life!” The small print also tells you that “Medicare will not cover preventative scans at this time.” I have not seen such a flyer before, although I am aware that many people have availed themselves of the MRI and CT-Scan services available in Gatineau, just across the river from Ottawa: http://www.stjosephmri.com/ You will notice that a doctor’s referral is required in order to obtain the services in Quebec, but no referral is needed for the clinic in Ogdensburg. After all, “certified technologists” and “medical doctors (M.D. )” administer and evaluate the tests. Who needs a referral? What is deceptive about this flyer is that it makes it sound as though you will get better, quicker access to a scan when, in fact, you’re getting access whether it’s necessary or not with no guarantee of any treatment should this untargeted care reveal any finding outside normal range on the scan you undertake. More importantly, even with these results in hand, your own family physician, and the specialist to whom you might be referred, will likely have to redo these tests. The reason is that most scans are undertaken with some direction as to the clinical presentation (what your symptoms are) and possible diagnoses. Also, while a medical doctor may “evaluate” your scan, there is no assurance that a specialist cardiologist or radiologist will supervise either the completion of the test or even provide the interpretation. The best care in Canada – and even in the United States – would require that a physician specifically trained to manage and interpret these tests would provide this service. In other words, this is not the standard of care that a Canadian patient usually has. There are many aspects of this kind of medicine that can be discussed but I want to speculate on why, for the first time in 25 years living at my current address, I have received this kind of flyer advertising “preventative scans” available for anyone. To me, this must be related to the decreased access to care that we are experiencing in Ontario. I am sure many will question my leap to this conclusion but the current difficulties regarding access to care are not just studied in Canada but also around the world. This Commonwealth Fund study showed that 41% of Canadians wait more than 2 months to see a specialist, one of the worst results among OECD countries: http://www.commonwealthfund.org/ In fact, this problem with access is one of the reasons often cited in the United States as a reason not to adopt the Canadian Model for healthcare. When people are worried about their health, they want answers NOW, definitive answers. Definitive answers are not at all the norm in medicine. The best diagnoses follow from a thorough history, careful physical examination and diagnostic tests. Any doctor reading this will remember being taught that blindly ordering tests will not yield a better diagnosis. Anyone who completed clerkship with me at St. Mary’s Hospital may remember being “scored” on the “right” tests – one point added for each correct test, one point deducted for each unnecessary test. As clerks, we felt relieved to have a positive score. Is there any doctor who does not remember returning to a patient’s bedside to listen to his lungs one more time? These skills are not part of the services being offered by the Ultra Life Clinic in Ogdensburg. It worries me that we have come to this, but I am not surprised. Granted that my work as an Ontario Medical Association Board Director means that many doctors tell me about the difficulty that their patients have accessing specialty diagnostic assessment. Granted that both patients and doctors are seeking better access. It’s unfortunate that these problems are now causing such worry that patients will seek out unnecessary tests because they are available when necessary care is not. Good medical care is not definitive, even in the 21st century. Preventative full body scans do not add information – they make diagnosis more difficult. In Ontario, I am worried that politicians believe that the answers are so simple that they can figure them out without doctors. 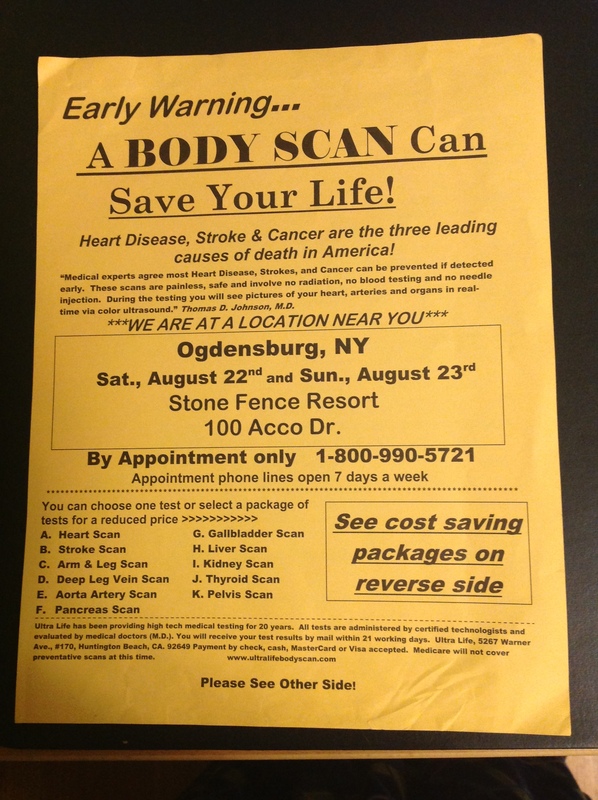 The impact seems to be that I now receive flyers advertising full body scans 45 minutes away in New York State. I’d like to be wrong but nothing convinces me that politics is any more definitive than medicine. Doctors are trained rigourously in uncertainties, learning to seek consultation. Are politicians?